'State of the Air' • American Lung Association assigns Salt Lake County an F for ozone and a D for particles; Utah receives the most F's of all. 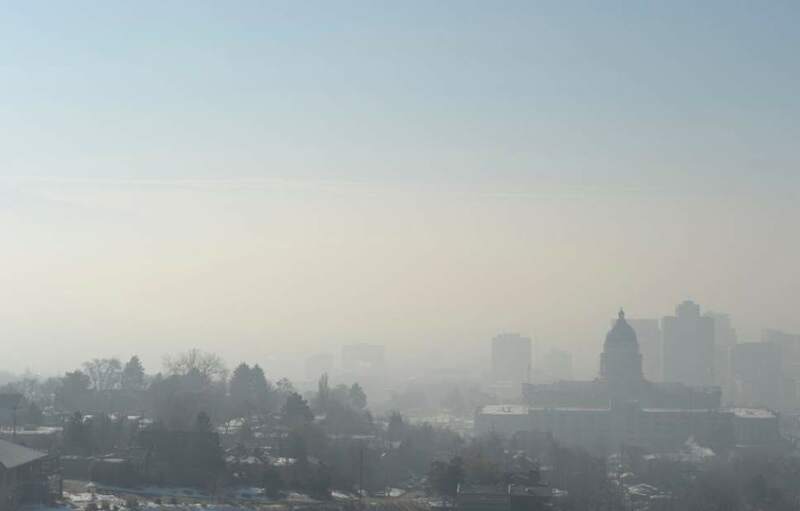 Francisco Kjolseth | The Salt Lake Tribune The pollution plagued Salt Lake valley is obscured by another red-air day on Wednesday, Jan. 22, 2014. Salt Lake City&apos;s air quality has improved, but is still ranked as the sixth worst in the nation, according to the latest State of the Air report from the American Lung Association. The annual report grades U.S. counties and metropolitan areas based on the number of days they&apos;ve exceeded the Environmental Protection Agency&apos;s health-based standards for ozone and particulate pollution. Salt Lake County received an F grade for both ozone and particles. Overall, Utah averaged an F for ozone and a D for particulate pollution. Particulate pollution is considered especially dangerous, as the tiny pollutants can lodge deep in lung tissue. In addition to receiving a failing grade, the Salt Lake City metropolitan area  which on the report includes Provo and Orem  was ranked as the sixth-worst city for short-term episodes of particle pollution. The Logan metropolitan area ranked seventh. Only one Utah county received an A  Washington County, for having few days of particulate pollution. But it got an F for its ozone levels. No other Utah areas received above a C grade. Shane Levy, deputy press secretary for the Sierra Club, said the fact that Utah communities received poor grades across the board shows more needs to be done by the EPA and the state to address air quality. "Utah&apos;s failing air quality grades demonstrate the critical need to take strong action to protect clean air and public health in local communities across the state," he said. Despite the F grade and the high ranking, Salt Lake City&apos;s air has shown improvement, said Paul Billings, senior vice president for advocacy at the American Lung Association. But the 2016 report is based on EPA data from 2012 to 2014 and does not take this year&apos;s severe episode into account. The report handed out a higher number of F&apos;s this year, in Utah and across the country. Billings said the downward shift in grades reflects the EPA&apos;s new standard for ozone, which was used for the first time in the 2016 report and made better grades more difficult to achieve, despite what Billings said was a nationwide improvement in air quality. "Even though we went back and re-analyzed all the previous data to track the trends, and even though certain counties that previously got a better grade got an F, we continue to see the number of days of unhealthy air improve," he said. One area of concern for Utah, Billings said, is the ongoing trouble with ozone in Uintah and Duchense counties, which both failed in that category. Uintah County ranked 13th overall for the nation&apos;s worst ozone pollution. Ozone comes with much the same health risks as particulate pollution, said Brian Moench, president of Utah Physicians for a Healthy Environment, though it garners comparatively little attention. Exposure to ground-level ozone can cause inflammation in the lungs and may permanently scar lung tissue. Uintah County&apos;s levels of ozone exceeded the new federal standard 83 times between 2012 and 2014, while Duchense exceeded the standard 52 times. Salt Lake City saw 34 overages in the same time period, also warranting a failing grade. Ozone formation is triggered by ultraviolet light, and most of the counties ranked worse are in areas with lots of sunshine. Wintertime ozone  what the Uinta Basin is experiencing  is rare. The phenomenon is little understood by scientists, but Billings said the severity of the pollution calls for action. "They need to figure it out and cut the emissions that are causing the ozone and harming health," he said. Moench said both ozone and particulate pollution are associated with increased rates of strokes, heart attacks, respiratory disease, cancer and premature death. He estimated that as many as 2,000 people die every year in Utah because of exposure to air pollution. "The fact that we rank poorly on particulate pollution as well as ozone indicates this is a year-round problem; it isn&apos;t just wintertime inversions," Moench said. In a statement, Alan Matheson, executive director of Utah&apos;s Department of Environmental Quality, pointed out that Utah&apos;s air is healthy on the majority of days. His department continues to work to reduce the number of days of unhealthy air, he said. "Partnerships, public education and enhanced regulation have improved air quality while promoting a growing and diverse economy in Utah," he said. "The department will continue to support research and take all appropriate action to protect public health."